Brief: Besides adding some style points to the plasticky KSCs, the common KSC75 mods do improve the already-great clip-ons, but at a price. 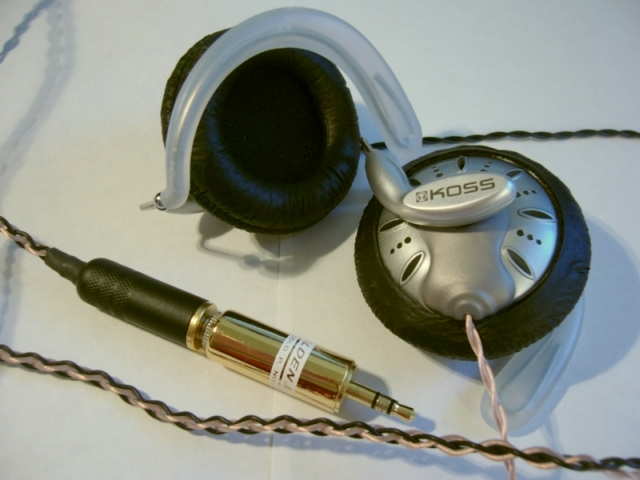 List of parts used: Mogami-recabled KSC75 ($30 from head-fi FS forums). 68 Ohm impedance adapter ($18, ebay). Sennheiser PX200 leatherette earpads ($6.99+shipping, Sennheiser USA). Kramer-modded grilles (10 minutes with a drill). Build Quality (6.5/10): Naturally, build quality depends largely on how good the recabling job is. The recable on my set was quite good so the only build issue is the same as with the stock KSC75s – the **** clips still come off on occasion. Comfort (8/10): Not much difference in comfort between these and the stock KSCs. If your ears are prone to sweating, the leatherette earpads may cause some discomfort and the earhooks may need to be reshaped to accommodate the thicker pads. I personally find the PX200 pads a bit more pleasant than the original foam ones. Like the stock KSCs, these can be worn comfortably for several hours, even while exercising. It should be noted, though, that my new cable is prone to microphonics. This is easily taken care of with a shirt clip to fix the cord in place. Isolation (2.5/10): Though the leatherette pads may help sound leakage around the ear these are still open headphones so the difference is minute. They do seem to isolate just a tad better because the earcups seal around the ear but wearing them on the subway is still not recommended. Sound (6.75/10): The sound changes quite noticeably with modding. Most of the difference comes from the Kramer mod alone. The sound varies widely with the way the holes are drilled. The more grille is missing from closer to the center, the more treble you get. Similarly, the outer edges of the grille are responsible for masking bass, so removing them adds bass quantity. Compared side-by-side to the stock 75’s, my modded ones have better mids and highs. They are even more forward and aggressive than the stock phones. The bass becomes less muddy (but also a bit less impactful) with the addition of the 68 ohm adapter. Another big addition is to the incredible airiness of the Koss phones with the Kramer mod and the PX200 pads. The stock KSC75s sound anything but boxed in but the modded set sounds like a small concert hall. The sound signature may not be perfect, but it’s extremely enjoyable, especially for those who already like stock KSC75s. Value (7/10): Even though I prefer the sound of these to my stock KSC75s, I cannot say that for the average listener the price tag and time investment would be worth it. I estimate that an enterprising head-fier not adverse to DIY could end up with a pair like mine for ~$55. Mine ended up costing a bit more ($62 to be exact). Still, they are definitely a fun project for anyone with a desire to get into DIY or play around with different sounds and configurations.